Thanks for joining me on my journey through the land of BricsCAD. During today’s tour we’ll explore selection methods. Be sure and stick around until the end, that’s when it gets really exciting! BricsCAD offers many different methods for you to select entities. You can select them before you launch an editing/manipulation command. Or, you can launch the command and then select entities. If you launch the command first, the options list in the upper right corner of the drawing area displays many of the selection options. The most common selection methods that you use in AutoCAD® are also available in BricsCAD. For example, you can pick two points, left to right, to specify a rectangular selection window. Or, pick right to left to specify a rectangular crossing window. And, you can enter additional options for other familiar selection methods. For example, you can enter P for the previous selection set or CP to select all entities that are inside or cross a specified polygonal boundary. In addition to the selection options that you may be familiar with from AutoCAD (in orange), BricsCAD offers others (in blue). You can, for example, select all objects outside a specified window or polygon. 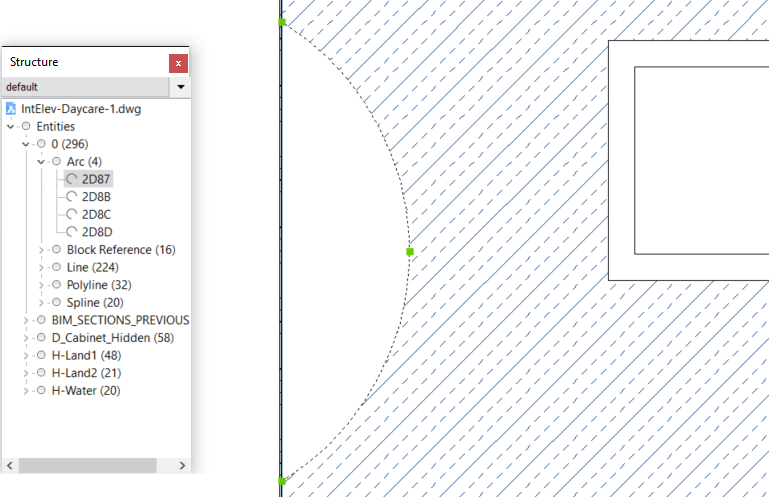 And, you can even create inside, outside, or crossing selections using a circular boundary! 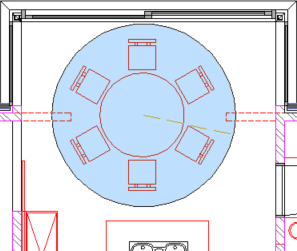 Another option, unique to BricsCAD, is the ability to pick a point in an area surrounded by closed boundaries. Any closed boundaries around that point are selected. Regardless of how you select entities, you can use the Properties panel to limit the selection to a specific type of entity. Then, with that subset selected, you can modify their properties. Like AutoCAD, you can access a Quick Select tool from the upper right corner of the Properties window. However, instead of launching a separate Quick Select dialog box, BricsCAD uses a variation of the Properties panel. In addition to accessing Quick-Select from the Properties panel, you can enter QSELECT at the command line. BricsCAD opens the Properties panel with the Quick Select tool enabled. You can then use the familiar Properties controls to apply filters for the entities you want to select. For example, you might specify all hatch entities on a particular layer with a particular pattern. Quick Select functionality also supports the following operators to give you maximum flexibility and control. For example, you can choose all circles with a radius greater than or equal to a specified value. You can apply the filters to the current selection set or select one of the tools below. The first tool adds the filtered entities to the selection set. The second one removes them from the selection set. And, the third tool adds the filtered entities to a new selection set. The powerful combination of Quick Select filters enables you to select exactly what you need. 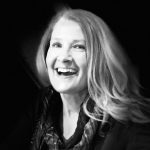 And, because they’re available in a panel rather than a dialog box, you can keep them open and easily accessible while you work! BricsCAD offers another method for selecting objects which is also very powerful. 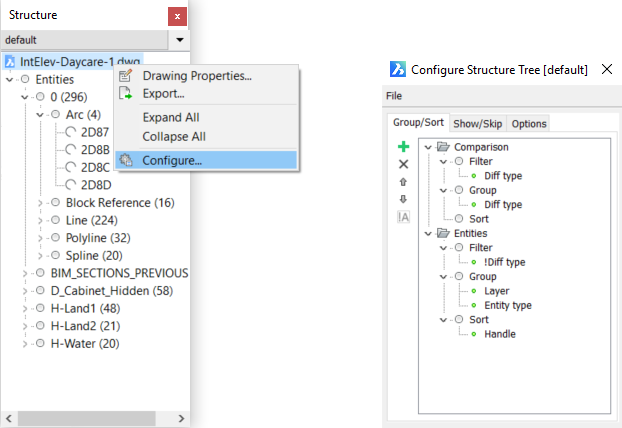 It’s called the Structure panel and you can access it with the STRUCTUREPANEL command. It’s also accessible, along with all panels, when you right-click on a toolbar or the ribbon. The Structure panel displays a tree view of drawing content. You can configure it to display drawing content in different ways. The default configuration for BricsCAD Classic is called Default. It displays all the entities in the current space (model space or layout tab) of the current drawing, first by layer name. You can expand any of the layers to display the entity types on each layer. Expand the entity types to see the individual entities listed by their handles. 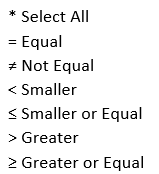 Numbers next to each category indicate how many entities it includes. In the example below, there are 296 entities on the zero “0” layer including 4 arcs and 224 lines. You can click a category at any level of the tree to select all the entities in that category. Or, click individual handles to select those entities. 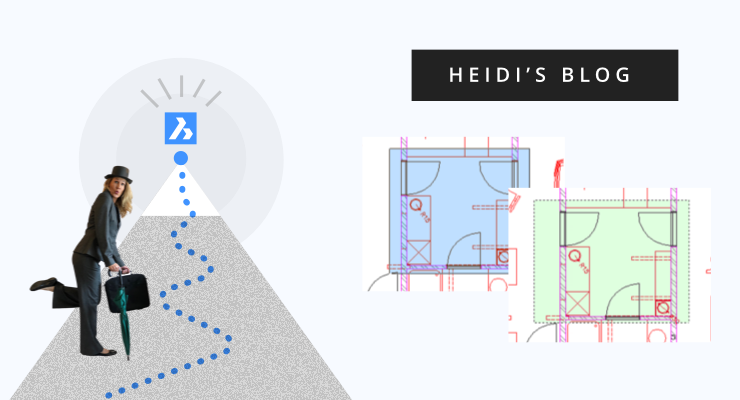 If you double-click on a handle, BricsCAD selects the object and automatically zooms to it. That’s handy!! You can change the configuration for the Structure panel if you right-click in the panel and choose Configure. I hope to share the process for customizing configurations in a future post. For now, I’ll show you the other Structure configurations that are included when you install BricsCAD. If you open the configuration list, you should see the Bim and Mechanical configurations in addition to Default. 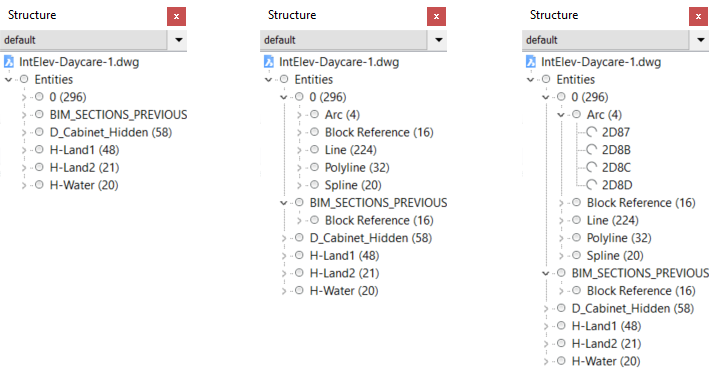 The Bim configuration displays the entities by type. The Mechanical configuration displays them first by type, then by layer, and then color. You can choose the Select option in the configuration menu to select your own configuration. I hope you enjoyed learning about some of the unique selection tools in BricsCAD. Come back next time as we take an in-depth look at Drawing Explorer.